Prepare a delicious culinary masterpiece is easier than it might seem at first glance. Sometimes it doesn't even require an oven. And a cheese cake without baking - direct proof. You first need to prepare the ground. So how to prepare a cheese cake without baking, as a test use a regular cookie. To do this, grind the cookies in a blender or coffee grinder. In a pinch you can use a conventional mortar. Butter melt on the stove or in the microwave, add the shortbread crumbs and mix thoroughly. Better for this cake to use a split mold, but will also fit parchment paper or regular foil, which is placed in the form so that the edges were outside. In prepared dishes, lay out the dough in a thin layer. Level the surface is conveniently a tablespoon or the bottom of the beaker. Place the mold in the refrigerator. While the base cools, it's time to cook the filling. Gelatin pour 100 ml of cold water and allow to swell for 10-15 minutes. Then put it in a water bath or in the microwave, but do not boil. Should get a homogeneous mass without lumps. Candy cut and fold in a small pot, add milk, vanilla and sugar and put on medium heat. Constantly stir until the sugar is dissolved and candies, then remove the mixture from the heat and slightly cool. Blend sour cream, cheese and candy-sugar mass, add the prepared gelatin and mix thoroughly again. You can also mix by hand, but if the cheese is not very soft, better to grind it through a sieve or mince. Pour the prepared filling over the cooled cake and again put in the refrigerator. Now, prepare the frosting. To do this, dissolve the candy and the milk on the fire in exactly the same way as for the filling. Make sure surface of cake is sufficiently frozen and has become solid, and only then pour the glaze. 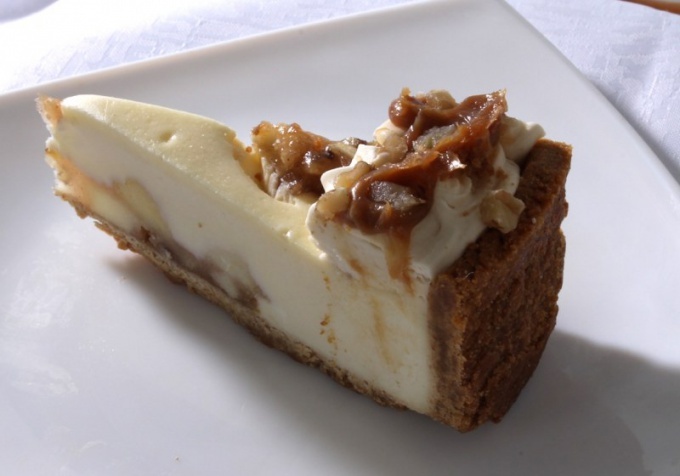 If desired, you can decorate the cheese cake with nuts. Then leave it in the fridge for about 6-7 hours. Before serving, the cake will release from the mold. To do this, gently pull the ends of the foil, and then remove it. Delicious and beautiful cheese cake without baking ready. Let the glaze was a bright color it can be colored with a small pinch of turmeric. For Foundation, choose a cookie that crumbles easily. Ideal "Jubilee", but you can use chocolate or nuts.